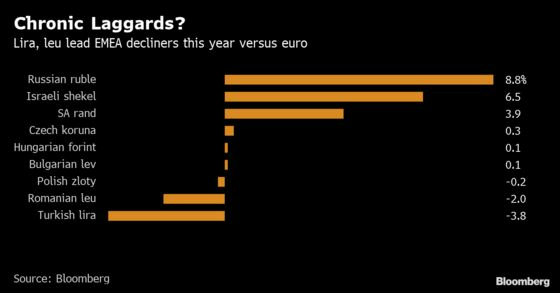 Turkey rattled investors by limiting their ability to exit lira trades in the run up to elections last month, while Romania is wrestling with plateauing growth and the fallout from a policy U-turn. Their troubled markets can expect little support from a fragile global economy, according to Marcin Lipka, a senior analyst at Polish brokerage Cinkciarz.pl, which topped Bloomberg’s forecaster rankings in the first quarter of the year for eastern Europe, the Middle East and Africa. Based on Lipka’s forecasts the lira will drop more than 8 percent against the dollar and the leu will fall a further five percent against the euro by the end of the first quarter next year. Lipka’s third prediction was for Iceland’s krona, which he said could fall almost 5 percent to 140 per euro by the end of the year following the bankruptcy of WOW Air Hf. The company handled 35 percent to 40 percent of tourist traffic to the country, he said.